Transmission assembly, Rebuilt. Rebuilding includes: 1. Degreasing 2. Disassembly and inspection 3. Rebushing 4. Recharging magnets 5. Regrinding and polishing drums 6. Rebabbitted universal ball cap 7. New ring gear 8. Assembly and adjustment. NOTE: Additional charges may apply if any parts of your exchange transmission are not usable. 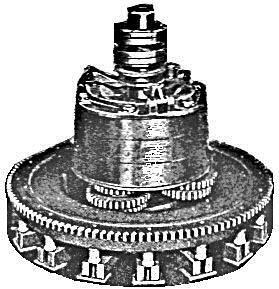 NOTE: The cost of the transmissions vary depending on the condition of your transmission core. Please call us for a price quote. NOTE: Additional charges may apply if any parts of your exchange transmission are not usable.